- Emphasis on combining light, nutrients and CO2, to make organics and oxygen. - The nutrients are non-living; but the organics are "living". - Half the world's chlorophyll is on land (in plants), and the other half in water (in algae). 2. How oceans, lakes and rivers work. - Chlorophyll consumes all pertinent nutrients, and generates and feeds all the life, using the sun. - In oceans, chlorophyll in the phytoplankton in the upper 100 meters of water does all this work. - In shallower reefs, the work is done by attached seaweed/periphyton. - In lakes, the work is much closer to the surface because of the dark waters. - In rivers, all the work is done by attached algae/periphyton. 3. The 10-to-1 biomass conversion factor. - Animals must consume ten parts nutrients for every one part they assimilate. - The remaining nine parts of nutrients are passed out as "waste". - These remaining nutrients then make up the food for the next level of animals to eat. - Algae therefore is ten times the biomass all animals (including microbes) combined. 4. What fish (and animals) eat. 5. How cultivation and filtration are related. 6. 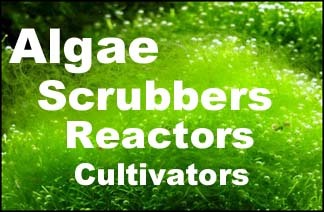 Algae scrubbers compared to aquaponics. 7. What makes a strong filter/cultivator. 8. The future of filtration and cultivation. Last edited by SantaMonica; 10-18-2015 at 12:39 PM. I think my engineering classes will be taking a different route. That curriculum makes sense, from an engineering (as opposed to biology) angle.